Apple's official internal policy on replacing devices with dead LCD pixels leaked this week, revealing that the company will replace an iPhone if it has just one dead pixel, while an iPad must have at least three to qualify. 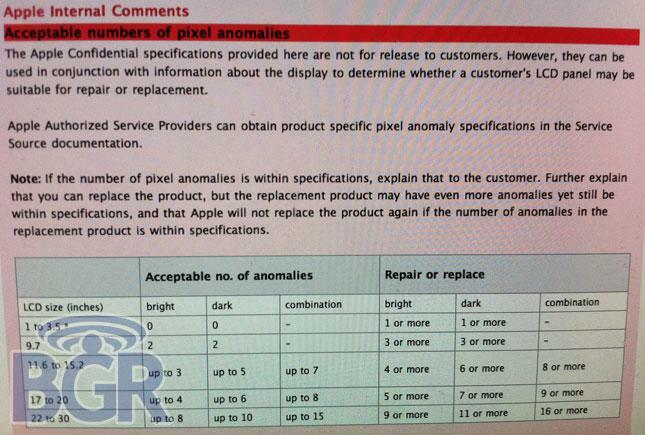 The internal Apple document, leaked by Boy Genius Report, reveals the loose guidelines employees must follow when a customer attempts to return a device with bad pixels on its display. Just one dead pixel is good enough for a replacement on a device with a screen size of between 1 inch and 3.5 inches. Apple's 9.7-inch iPad display must have three or more dead pixels for the unit to qualify for a replacement. Things get a bit more complicated with larger screens —including laptops, iMacs and the company's Cinema Display —as a distinction is made between "bright" and "dark" faulty pixels. Apple Store Geniuses are, however, given some leeway. The internal document states that authorized service providers must explain to the customer that they can replace the product, but that replacement may have even more dead pixels or other issues. Apple will not replace the product again if the replacement product is within the written guidelines. "If you ask for a first replacement product due to bad pixels, you should always get it, with no arguments and no restock charges (if this isn't your first experience, ask to discuss it with a supervisor)," the report said. "However, if the replacement unit is still within spec —which for anything other than an iPhone or iPod touch, may mean more pixels depending on how bad the first unit was —a second replacement is ruled out." Dead pixels are a somewhat common occurrence on LCD displays. They can stand out as either a dark or light spot on a screen on any of Apple's products with displays. A number of confidential internal support documents from Apple leaked this week, including one that revealed that the company is working on a software fix for issues with its new thin-and-light MacBook Air notebooks. Some users have experienced display issues, including horizontal screen flickering and fading.